Since Fridays are such happy days, I thought I was extend that happiness and share a favorite place/item in my home! 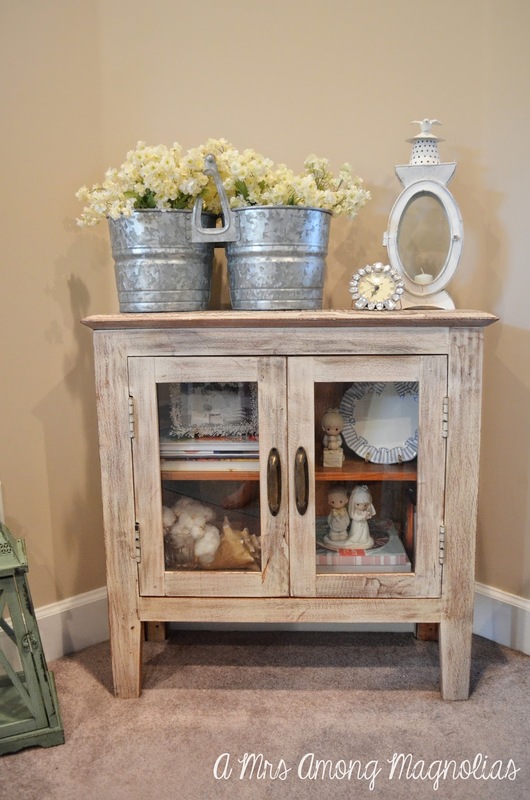 And since yesterday I shared my dirty little secret of being a dish junky, I thought I would show y'all that large distressed cabinet's sister! My mom found this almost a year ago now at Marshall's we were out looking for a burlap stocking to match one I already had. She called me over because it was on sale, and I remember literally dropping almost all of the christmas items I had in my hands when I saw it! The top right photo in the below collage was the day I got it, and since then its been in many different places and has been adorned with a variety of decor! 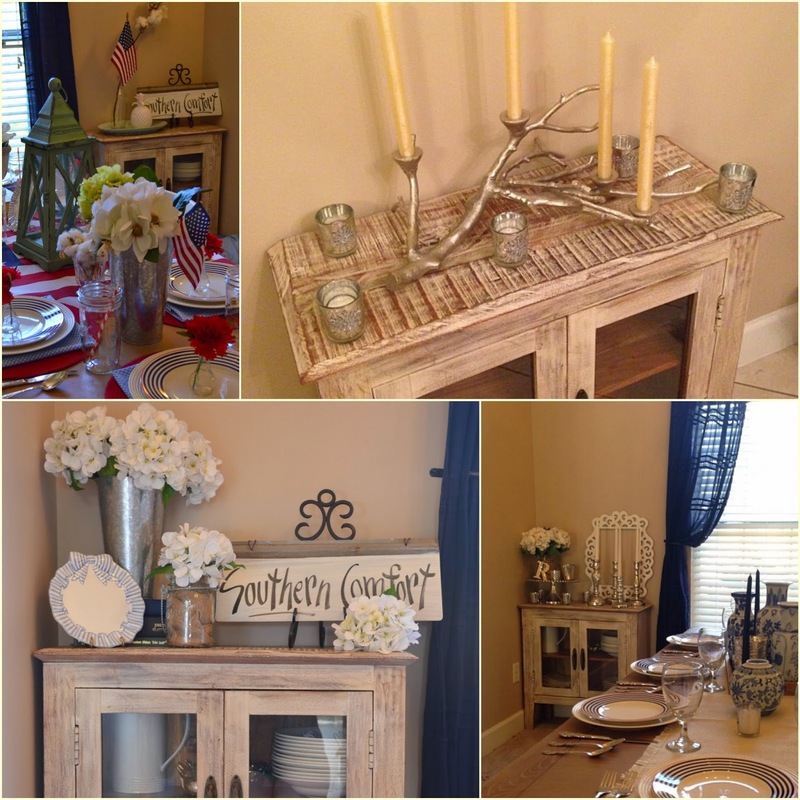 Now, it is in our living room and houses some of my favorite items in our home! One Saturday afternoon, not long after we bought our house we decided to drive around and see what all was around us. We stumbled upon a consignment store and I had to go inside. I was in my usual zone when I go in these places, when KJ came up with this white lantern and he thought I would like it. Like it I did! I means so much to me when he goes shopping with me for our home and picks out something on his own! 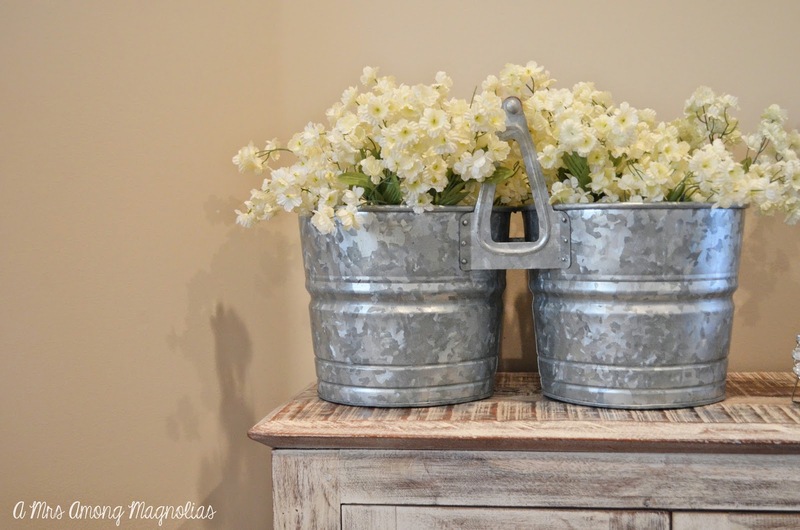 The double galvanized bucket was a wedding gift and it is filled with our ever popular wedding flowers! We bought all of the ones our Hobby Lobby had, and we had to order more! They pretty much knew us by name before the wedding! Side Note: When someone first mentioned the idea of using fake flowers for our wedding I wasn't too happy about the idea. Forget the fact that we were getting married in the middle of July in 90+ degree weather, I still wanted real flowers! 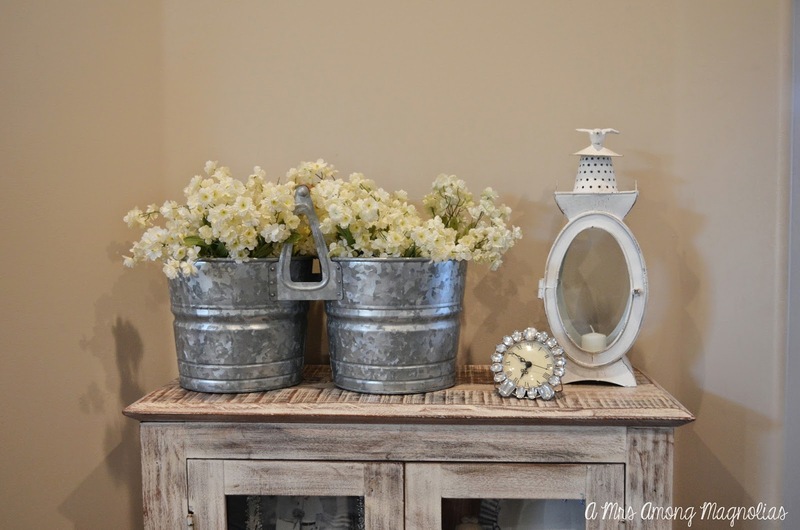 But, I am so glad I decided to choose fake, because now we have all these flowers to decorate our home with! 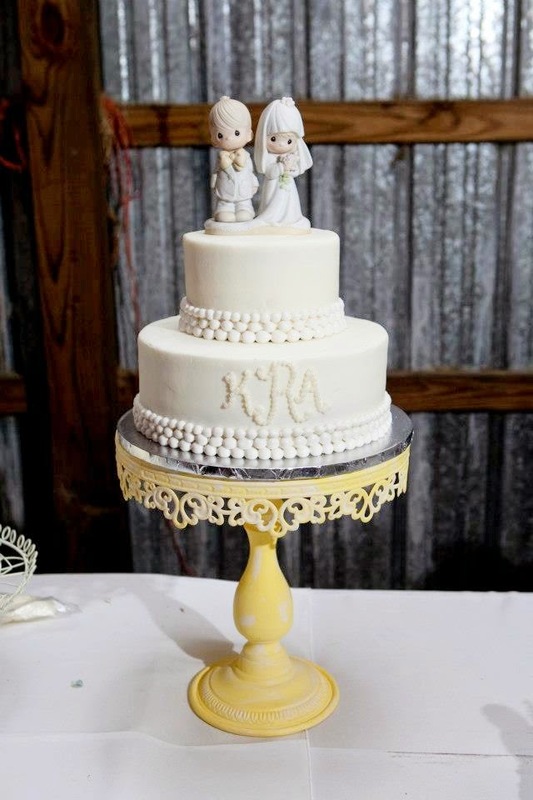 This cabinet also houses our wedding cake topper. I found this at an antique store before we were even engaged, and my mom tried to talk me out of it saying that I would change my mind by that time and it would be a waste of money. Well, I proceeded to purchase it anyways. 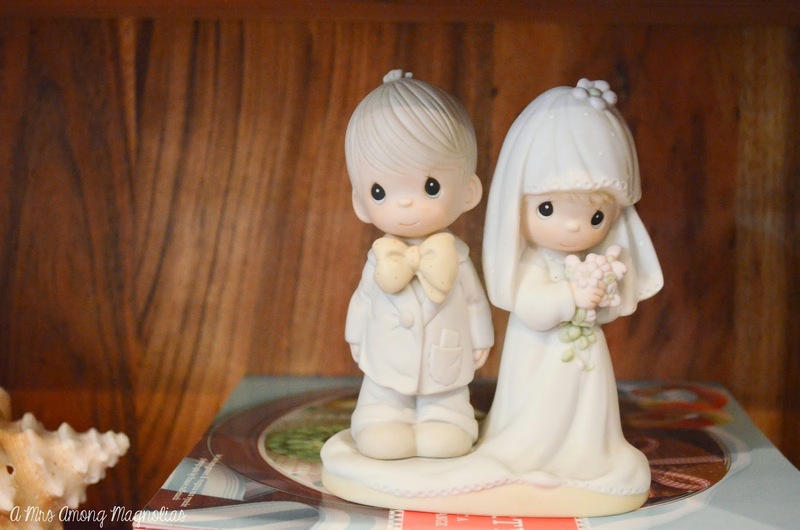 My grandmother was an avid Precious Moments collector and this just reminds me of her and my grandfather! It was like having them there on our wedding day, even thought they couldn't be physical present. 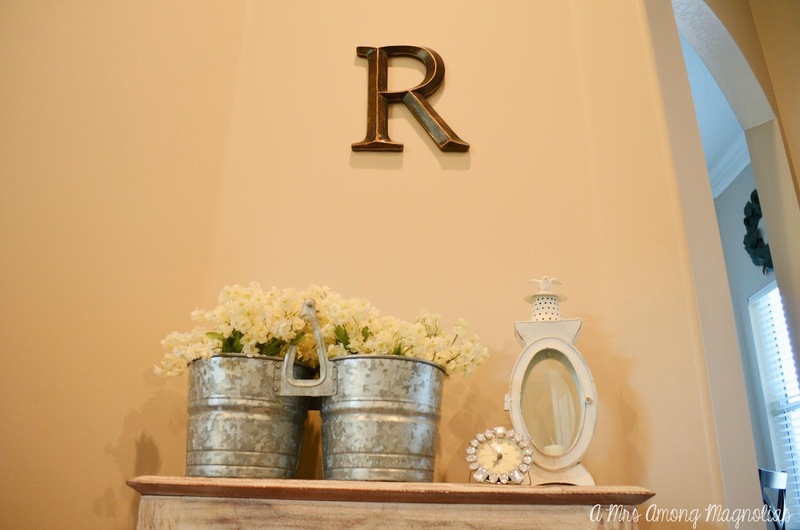 What is your favorite item or place in your house? I love hearing the stories behind pieces because it shows were the piece came from and where you are going to take it!